Yellowfin tuna on Nikko Okiami Shrimp #30 (bottom right of photo). Nikko’s are so effective they are used by commercial fishermen around the Pacific. This recent photo shows a commercial fisherman in Hawaii with a his recent catch on a Nikko shrimp. On this slow day when live bait would not produce, Nikko’s baits did. 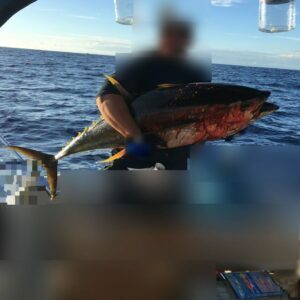 In fact, when this fisherman shared his Nikko’s baits with another commercial fishing boat, they too began catching tuna. Although Nikko’s baits won’t always out produce live bait, they do it quite often enough that more and more commercial fishermen are carrying a variety of Nikko baits in their vessels. Nikko’s baits are scented and super durable, saving commercial fishermen time, money and space….and catch fish just as effectively as live bait. Typically, baits can be reused multiple times, even for large fish. Fishermen save time with rigging. They save money with durability. They save space and weight by not requiring a freezer to keep the bait fromp spoiling. They save many days out on the water when nothing else works.